When we think of the catastrophic aftermath of a fire, the red and orange flames are usually the force that take the brunt of the blame. Fire is one of the most inherently destructive natural forces that exists; it conquers almost everything it touches with ease, and is responsible for an innumerable amount of lost lives and ruined property. However, fire has an insidious accomplice, one whose damage is more subtle and overlooked, but dreadfully destructive nonetheless. This silent killer is smoke, and it’s responsible for not only more human deaths than fire has caused, but also for an immense amount of property damage and other problems. In this blog post, we’ll look at some of the dangers that smoke damage can cause, how to identify it, and the importance of calling smoke damage repair services. 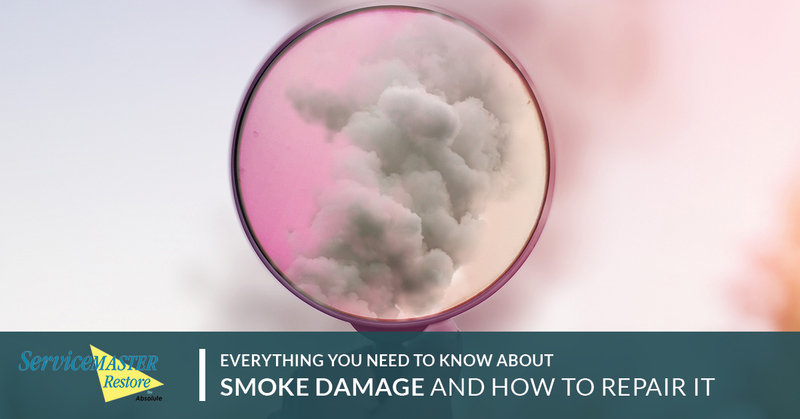 Clearing up the smoke is an essential component of fire damage restoration, so it’s important to know the facts. To understand the effects of smoke damage, it is important to understand what smoke is in and of itself. Smoke is made up of carbon monoxide, carbon dioxide, and soot. Carbon monoxide is lethal in large doses, and soot (made up of tiny particles of burnt material) is harmful to your respiratory system, especially when taken in over a long-term period, which can cause cancer. From a purely cosmetic standpoint, smoke is a nuisance because it wears down a lot of common materials in your home, primarily metal and paint. This is due to the presence of soot, which is acidic in nature. This acidity doesn’t play well with most elements, causing discoloration (usually yellowish), or corrosion in the case of metal. Unfortunately, aesthetics are the least of your worries when it comes to soot. The reaction caused by soot is ongoing unless it’s removed, meaning that whatever it’s binded to will slowly degrade over time. This can be a problem for structural integrity, whether it’s wood or metal. Did you know that smoke kills far more people than flames actually do? Indeed, many victims of a “fire” are actually people who died from excessive smoke inhalation rather than burns. Sometimes victims of a fire get out with zero burns, only to be taken later by the taxing effects of smoke on their respiratory system. It suffices to say that smoke is extremely dangerous to breathe in, so it should be no surprise that it’s bad news when it’s sitting there, lingering in your home. Though its effects won’t be as powerful as they would be in a full-fledged fire, smoke is a slow, silent killer and will wear you down as long as you allow it to exist in the materials of your home. Finally, smoke has the ability to get caught up inside of your HVAC system. We don’t need to tell you why this is something you don’t want to be happening. If you’re experiencing smoke damage in your home, call a smoke damage repair service immediately to prevent these problems. An oft-unknown fact about smoke is that it can also become electrically or magnetically charged. 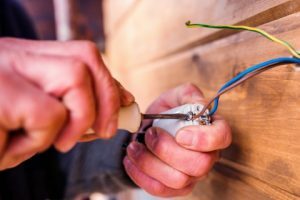 When it gets up in the business of wiring and electronics, this can be a problem that causes short circuits and/or overheating, That, combined with the corroding effects that smoke can have on metal, mean that smoke doesn’t play well with electronics. When you’re doing a fire damage restoration job, smoke damage can be frustrating because of how many areas it can permeate into. However, you might have an easier time understanding where to look for smoke damage if you have an understanding of how smoke likes to behave. Smoke, in a nutshell, seeks out cooler temperatures and travels until its energy has been expended. As such, it follows some generally predictable patterns, though you can never completely accurately guess exactly where smoke will embed itself. This is the easiest and most obvious answer; smoke is essentially a form of hot air, and hot air rises. If you’ve had a fire incident, expect to find smoke damage in your ceiling, particularly in the areas where the flames were the most powerful. Because of the hot air that rises in a fire, a cold pathway opens up for smoke to find its way to windows and the walls surrounding them. Smoke has a tendency to get everywhere; don’t be surprised if you find smoke damage around your windows, even if the fire was concentrated far away from them. Due to the electrical charge that we mentioned above, generally referred to as “ionization,” smoke naturally gravitates to a lot of synthetic materials. Have you ever sat around a campfire and realized that your clothes smelled like smoke afterwards until you washed them? That’s an example of this in play, and the basis of this whole post—smoke can get itself into materials and remain there until it’s extracted in some way (like a thorough washing). The process of fire damage restoration is a thorough, involved process that requires a lot of investment into a lot of different areas. As such, it can be easy to neglect smoke damage, but we don’t want you to fall into that habit. There are two methods for treating your smoke damage—solo efforts and professional services. However, it’s not really a question of which one is better; doing both is the best way to ensure that the problem is fixed. The simplest answer here is to clean. Clean everything! Clean everything as much as you’re able to. For most things in your house, that’s the best treatment that you can give on your own. Remember that the essence of smoke is soot: tiny particles of burnt material. So smoke, despite the fact that it’s more or less gaseous, has some physicality to it and can, in fact, be washed out. If you see visible smoke damage or even suspect that it’s there, giving a good deep clean will go a long way into reducing the damage. Unfortunately, some hard scrubbing won’t take care of your smoke problem by itself. There are some objects and materials that can’t be traditionally cleaned, and many other areas where it’s just not a viable option; smoke can get inside the walls, in your air system, in your electronics, and more. The odds of you being able to take care of all the smoke damage by yourself are extremely low, and that’s where it helps to have a professional touch. Professionals will be able to diagnose the extent of your smoke damage due to extensive experience working in a variety of situations where smoke has done its work. On top of this, they’re equipped to handle the problem areas of a building that you just can’t get to on your own. At ServiceMaster Absolute, we’ve worked wonders in smoke damage repair, doing some of the biggest jobs in San Diego history. In three days, we transformed a 750,000 square foot, seven-story sanctuary from a burnt smoky shell to a glistening clean, soot-free wedding chapel—imagine what we can do for your home! Don’t let smoke destroy your home. Call us today for a free quote!